Recovering Working Mom: Dirty little secret . . . Dirty little secret . . .
. . . and the Dugdales are cleaner than they’ve ever been! I didn’t blog yesterday because I just lost 24 hours of my life I will never get back. Here is something that stay at home mommies (or any mommies for that matter) never talk about . . . head lice. Oh yes my friends, I said that four letter word. And I’m tellin’ ya, that word deserves a special place in the 4 letter dictionary, right after the word f*#!ing. On Friday afternoon I got the call every parent dreads that the baby had been spotted with head lice. So, I immediately picked everyone up and checked them out. Sure enough, all three had it. Here’s the kicker . 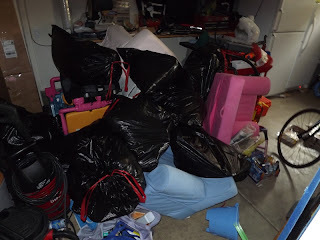 . .
it was 2:00am on Saturday when I started this blog post while I was waiting for the lice shampoo to work on MY head. Yep, that’s right, I admit it, I had lice too! My husband’s the only one who escaped. And yep, it’s just as humiliating to write it down as it is to tell your friends in person so that they can protect their kids. But here’s the thing, it’s also really liberating and none of you will ever have to wonder if it was my kid who caused the outbreak at school . . . I’ll just tell you (ok, maybe I won’t tell you when they’re in high school and their friends can read this because that would be a level of humiliating that I’m certain they would not survive). Here’s the reason I’m revealing this “dirty little secret”. First, I’m too transparent and keeping this secret would have killed me – there’s just too much to laugh at – once you get past the “cleaning” phase. And second, to make all those moms out there feel better that it’s happened to them, and also hopefully encourage them NOT to keep it a secret. As I’ll outline, this is a horrible thing to have to deal with, so we’ve got to stick together and prevent its spread. 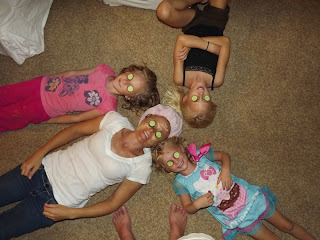 We can eradicate polio and put a man on the moon, but head lice eludes us! 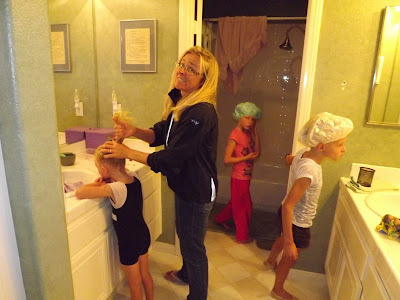 1) DO NOT judge your friends who kids (or themselves) are afflicted with head lice. I would not wish this on my worst enemy, and this isn’t something that “dirty little kids” get. It’s as common and as easy to get as a cold and sometimes you’re lucky not to get it, but your time will come. And, Karma’s a b*#@(. If you judge others, it will come back to bite you THREEFOLD! 2) Don’t let your kids come into your bed in the wee hours of the morning. It doesn’t matter that they’ve just had the worst nightmare of their lives. To hell with them, it’s not worth the torture you’re going to have to put yourself through to remove whatever parasite they have brought into your bed. And all the stories you’ve heard about how horrible it is, THEY’RE ALL TRUE! It was 3:20am when I went to bed on Saturday after a grueling EIGHT hours of dealing with these boogers. And, it’s back at it in the morning too. 3) When I envisioned “girls night in” with the girls, it did not involve a fine tooth comb and several hours examining every strand of hair on their head. We did manage to squeeze in a little fun, but it was a loooooong road getting there. Face masks and cucumbers at midnight. Rest assured, their hair is clean - mine, still cooking. they've ever been and we're not done yet! Recommendations for today – home school your kids and never let them have playdates or leave your home. Surviving a disgusting rite of passage with your sense of humor in tact Priceless! Check your kids heads VERY THOROUGHLY. Those little boogers are tiny and often they look like specks of dirt or dandruff. If you can’t wipe it away easily, more than likely it’s lice. Have someone check your own head (my issue wasn’t nearly as bad as the kids, but they were in there). Buy Denorex shampoo and Suave Coconut conditioner – they don’t like the smell of coconut and the Denorex helps with itching (just in case). Buy Quit Nits Spray and spray your kids’ heads every day before school or any sporting activities. 1) RID is disgusting and will make your entire house smell. It seems to have taken care of the live bugs, but honestly, we all smell like rotten eggs. Also, it didn’t kill everything on one of the girls’ heads and we had to use Mayonnaise for 6 hours to suffocate the rest of them. My recommendation is start with Mayonnaise. Yes, it sounds disgusting, but your alternative is a continuing lice problem, or lice who are immune to RID because it's a chemical. 2) Put conditioner in their hair to comb out the nits – you must have a special nit comb and they give you some gel to put in their hair – lots of conditioner will also work and it’s cheaper. 3) Comb strand by strand and I recommend you have a partner do it with you because unless your child’s hair is very short and thin, this will take at least 2 hours per child! 4) The next day, put vinegar on their head for 15 minutes. Wash it out and comb through again (this round won’t take as long because there won’t be as many as the day before, but this is absolutely necessary). 5) Wash their hair with the Denorex and condition with Suave Coconut Conditioner. 6) Spray their hair with “Quit Nits” and braid long hair. 7) Wash all linens, clothes and couch covers in HOT water. 8) Cover your pillows and mattresses with covers (you can buy a 2 pack for $5.99 at Bed Bath & Beyond) – I would recommend this anyway. 9) Put all brushes (including yours and your husband’s) in an alcohol bath (rubbing alcohol, that is – don’t waste the good stuff), and then wash them out with hot water – or, better yet, throw them all out and spend $30 to buy new brushes. 10) Quarantine stuffed animals for 4 weeks – yep, 4 weeks. If the kids don’t miss them, use it as an opportunity to clean house! Been there, done that, with FOUR girls no less. I was lucky to not actually have any, but I still did the treatment. And RID didn't work for us, but the mayo did. A heavy coat of mayo, wrap the head with plastic wrap for an hour, then follow up with an apple-cider vinegar rinse. Repeat every night for three nights, as well as all the cleaning. The bedding has to be washed in super-hot water. As you said, Heather, it has affected every family, even Pastor's families! We found an electric comb to work quite well: LiceGuard Robi Comb is the name. It zaps the lice dead. It does burn the scalp a bit, but at least the lice are gone (just kidding!). Art is in the eye of . . . The tooth fairy's on a spy mission . . .
Mommy's turned the world upside down . . .
You are soooo last season . . . Beat the parents . . .
Brownies, brownies, everywhere . . . When it's dark outside . . .
A beer bong, an island and the drunk tank . . .